For undergraduate incoming and transfer students needing advising, contact our professional advisor Sarah Krizan. into Ford Hall Room 116 or email her in advance for an appointment. Otherwise, Sarah is normally located in the Francine Parker Advising Center. The School of Art & Design office is located at 114 Ford Hall. The University Gallery and Student Gallery are located in the EMU Student Center. Ford Gallery is located in Ford Hall. 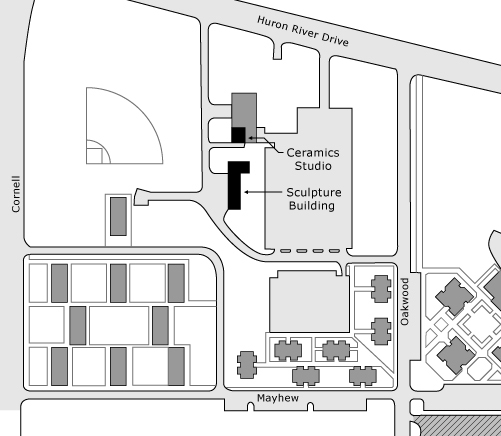 The Sculpture and Ceramics studios are located Northwest of the Student Center near Huron River Drive. take US 23 to Exit 37 - Washtenaw Ave. Eastbound. Proceed East on Washtenaw for approximately 3 miles to the campus. 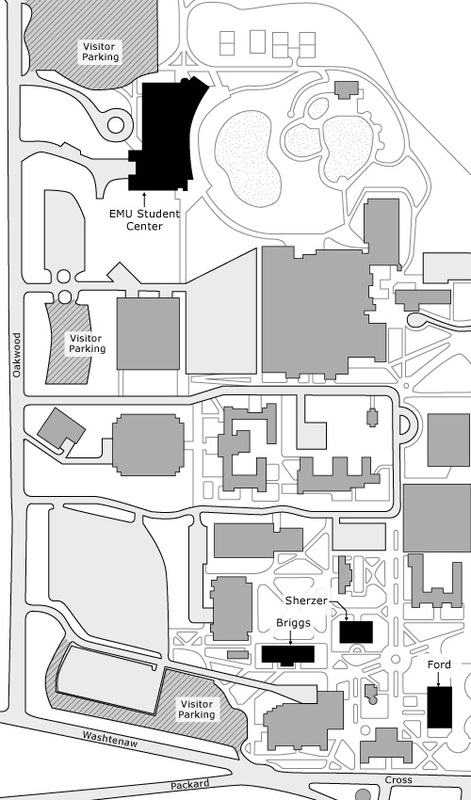 If you plan to park in the paid visitor's lot, turn left on Oakwood Ave.
take US 23 North toExit 37 - Washtenaw Ave East. Proceed East on Washtenaw for approximately 3 miles to the campus. If you plan to park in the paid visitor's lot, turn left on Oakwood Ave.
Take I 275 North to I 94. Take I 94 West to Exit 183 - Huron Street. Proceed North on Huron on Cross Street. Turn right on Oakwood for parking. take I 94 East to Exit 183 - Huron Street. Proceed North on Huron for approximately 1 mile, then West (left) on Cross Street. Turn right on Oakwood if you plan to park in the paid visitor's lot. take I 94 West to Exit 183 - Huron Street. Proceed North on Huron for approximately 1 mile, then West (left) on Cross Street. Turn right on Oakwood if you plan to park in the paid visitor's lot.